In 1997 Global Training Centre owner and CEO Debbie Shelley was approached by a multinational Oil and Gas company to provide a Safety Leadership training class for Supervisors and Managers. The multinational and Global Training Centre had a long history of working together on many safety training programs with tremendous success. The resultant product delivered to the multinational was branded as SEFSAM, which stood then for “Safety Essentials for Supervisors and Managers”. The SEFSAM program went from being a small project in South East Asia in developing Safety Leaders to a mainstay within the Oil and Gas Multinational’s Safety Leadership Development program for all Supervisors and Managers worldwide. Once SEFSAM began to be recognized by other Oil and Gas multinationals such as Exxon Mobil, Shell and Chevron (along with many others) SEFSAM was edited and branded to meet specific company needs and enhance ongoing Safety Leadership initiatives. The SEFSAM name became quickly recognized within industries not just Oil and Gas related but in other areas such as Mining, Shipping, Manufacturing and Mega Construction projects. The original SEFSAM program is utilized by a who’s who of the largest Oil and Gas and Energy Service companies in the world. Our team continues today to work with safety leaders across every continent and in countries such as Angola, Nigeria, Turkey, Romania, Germany, Norway, Scotland, Russia, Malaysia, Indonesia, Australia, Qatar, U.A.E, Papua New Guinea, Canada and the United States. The SEFSAM program became so popular that we began to license and train teams within organizations to provide internal SEFSAM training to ensure everyone is provided the tools to become an effective safety leader. It was in 2010 that the popularity of SEFSAM brought about another opportunity for the Global team. The creation of our Safety Leadership Development tools called the WITS “Workplace Intelligence ToolS” from our Workplace Excellence division allowed safety leaders from every hierarchy the ability to utilize our WITS tools to ensure the proper application and sustainment of the SEFSAM program. Our associates worked for many years as facilitators delivering SEFSAM and once we had our WITS tools the process of supporting safety leaders in performing and adapting to new behaviours more sustainable. The WITS tools and the use of the Workplace Excellence 4 stage application and sustainment model has been used by Senior Executives and front line leaders alike to ensure the best possible safety performance. 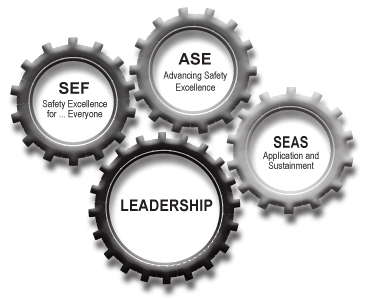 As our SEFSAM and Workplace Excellence products grew in popularity we decided in the spring of 2016 that the Global Training Leadership division and Workplace Excellence formally merge into one company, And we were proud to relaunch our products within our new company “The Global Centre for Leadership and Safety Excellence”. SEFSAM now stands for Safety Excellence for Supervisors and Managers and the supportive Workplace intelligence Tools from Workplace Excellence continue to work seamlessly to ensure our clients are able to develop, apply and sustain the best in class safety leadership behaviours they expect.